I’ve been working on an article about PECOTA‘s best-projected players for the next decade. Basically, if you were starting a team from scratch, without any salary or service-time considerations, how should the top of the draft board look? Here’s a spoiler: Mike Trout is no. 1. By a wide margin, too. You may have heard that Trout also now tops the list of highest-paid athletes ever, signing a record-breaking 12-year, $426.5 million contract that keeps him with the Angels through his age-38 season in 2030. I’ll finish that other article later, but today let’s focus on what PECOTA sees in Trout’s future. For starters, PECOTA is only built to project 10 years into the future, at which point Trout will still have another two years remaining on his deal with the Angels. Of course, the motivation for this deal from the Angels’ perspective is clearly not what might happen in 2029 or 2030, but rather how many amazing seasons they can get from Trout before then (and after he would have been a free agent two offseasons from now). Plus, if PECOTA is even close to right about Trout’s next decade, anything he does in those final two seasons will be gravy and then some anyway. PECOTA projects Trout to be the best player in baseball this year, with 8.4 Wins Above Replacement Player. This is the fifth time in the past six seasons Trout has been PECOTA’s best-projected player (he was second to Buster Posey in 2017) and his 8.4 WARP is the top projection for any player since Albert Pujols in 2010. Trout has played seven full seasons—from age 20 to 26—averaging 8.0 WARP per 150 games and topping 7.0 WARP every season except 2016, when he managed “only” 6.2 WARP due to an extended stay on the disabled list with a thumb injury. He’s pretty good, is what I’m getting at. That adds up to 80.3 WARP projected over the next 10 seasons. To put that in some context, consider that Ken Griffey Jr.—a first-ballot Hall of Famer and undoubtedly one of the greatest center fielders of all time—totaled exactly 80.3 WARP for his entire 22-year career. 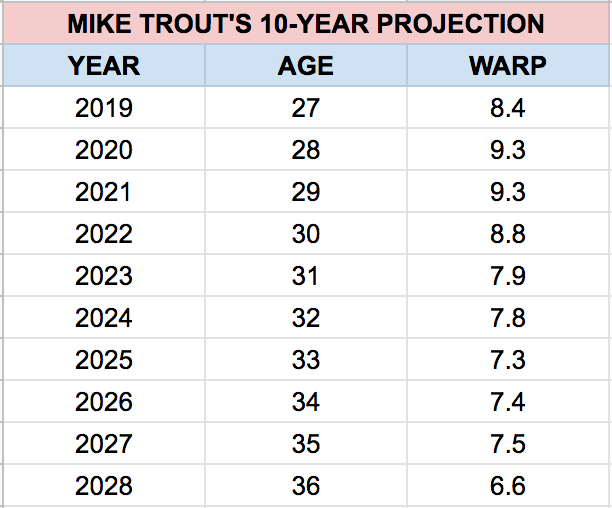 (Trout would have a career total of 135.1 WARP through age 36 if those projections prove accurate.) Further context: PECOTA projects this offseason’s $630 million free agent duo of Bryce Harperand Manny Machado for 67.8 WARP over the next 10 seasons … combined. On one hand, the big news here is that PECOTA does view Trout as human, projecting him to have a relatively normal aging curve—peak from 27-30, decline from 31-35, further decline at 36. On the other hand, even after a decade of aging and two clear decline phases he still projects as an MVP-caliber player at age 36 (presumably as a right fielder or maybe a designated hitter). Based on those numbers, it seems safe to assume PECOTA would project Trout for at least, say, 5.0 WARP at 37 and 4.0 WARP at 38. That would bring his total for the duration of the 12-year contract to 89.3 WARP. Trout was already under contract for $33.25 million in both 2019 and 2020, so the new deal represents a modest 10 percent raise in annual salary in the form of a 10-year, $360 million extension. Even a conservative dollars-per-WARP estimate based on current salaries and revenues pegs the value of 89.3 WARP at around $700 million. Less conservative estimates and/or factoring in inflation over the span of 12 years would bring the value closer to $1 billion. In other words: If those projections come anywhere close to reality, $426.5 million (or $360 million) would be a tremendous bargain. In addition to 10-year projections, another fun PECOTA feature (available to subscribers on all player pages) is historical same-age comps. Using a wide array of factors, PECOTA identifies the most-similar players in MLB history at the same age, which is a big factor in projecting an active player’s future. That’s seven Hall of Famers, one sure-fire eventual Hall of Famer, and two elite active hitters with Hall of Fame potential. I’m especially delighted by three of Trout’s top four comps being Joe DiMaggio, Mickey Mantle, and Willie Mays, while the fourth is Frank Thomas. Who are the most similar players to Trout in baseball history? Three legendary, inner-circle Hall of Fame center fielders and a 6-foot-5, 250-pound Hall of Fame first baseman. Sounds about right, actually. Of particular interest to the Angels and their fans is how those great, similar-to-Trout players aged. We’ll set aside Giancarlo Stanton and Paul Goldschmidt, because their stories aren’t finished being told yet. Pujols’ story is technically also still being told, but I think we’re pretty sure how it ends, so let’s include him. 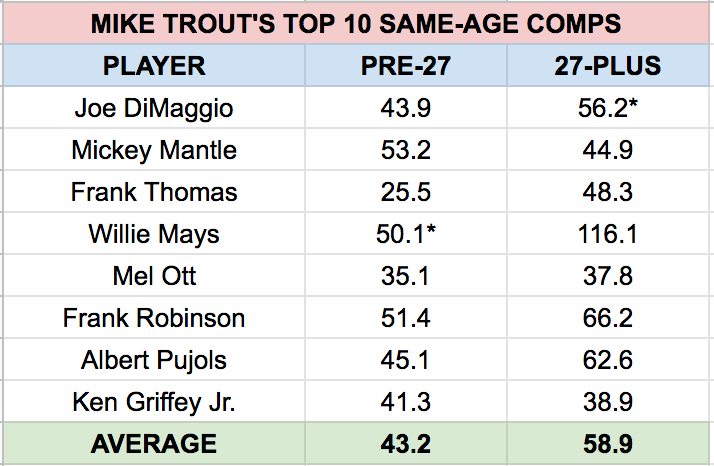 Trout amassed more WARP through age 26 than any of his star-studded top comps, which is remarkable in itself. As a group, the eight comps produced 36 percent more WARP from age 27 on compared to through age 26. Trout has 54.8 WARP now, so a 36 percent increase would mean adding another 74.5 WARP from 27 on. PECOTA’s decade-long projection has him at 80.3 WARP (plus whatever you want to credit him for in years 11 and 12). With comps like that, even the worst-case scenarios are damn good. The fewest 27-plus WARP is 37.8 by Mel Ott, whose career ended in 1947. The next-fewest is 38.9 by Griffey, whose 30s were wrecked by injuries. Pujols is often cited as a mega-deal gone wrong, but he didn’t sign with the Angels until he was 32. He has an impressive 62.6 WARP from 27 on, including back-to-back MVP awards at 28 and 29, and a runner-up at 30. Even if Trout only produces another 38 WARP, matching Ott and Griffey, he’d still be worth $426.5 million given how salaries are likely to rise over the next decade. No one in the history of baseball has been better than Trout through age 26. PECOTA envisions him aging beautifully, projecting MVP-caliber seasons into his mid-30s and favorably comparing Trout’s career to this point to some of the greatest names in the sport’s history. If ever there was a time to make a $426.5 million bet on a baseball player aging well, this is it. Mike Trout is so good, he can turn $426.5 million into a bargain. Let’s look at some of the relief options available for the #Cubs.